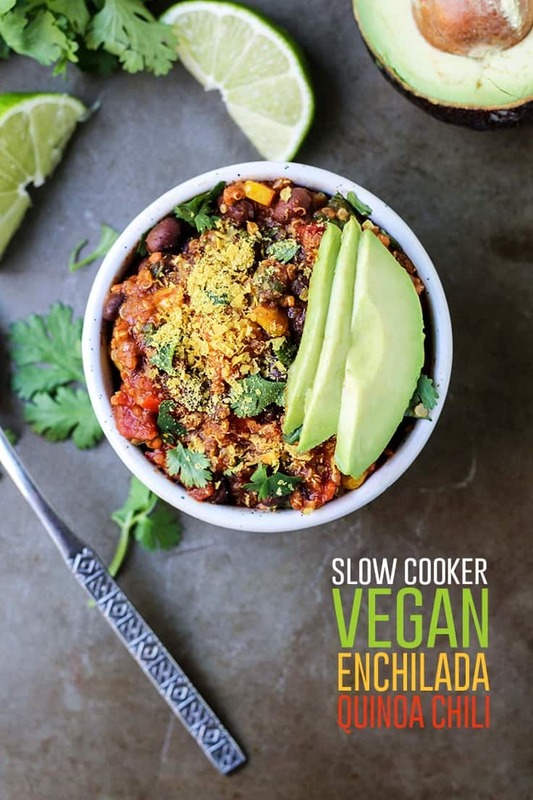 Lots of flavor in this Slow Cooker Vegan Enchilada Quinoa Chili. You won’t miss the meat in this thick and hearty plant-based meal, plus it’s gluten-free! This post is sponsored in partnership with NOW Foods. All opinions expressed (as always) are my own. 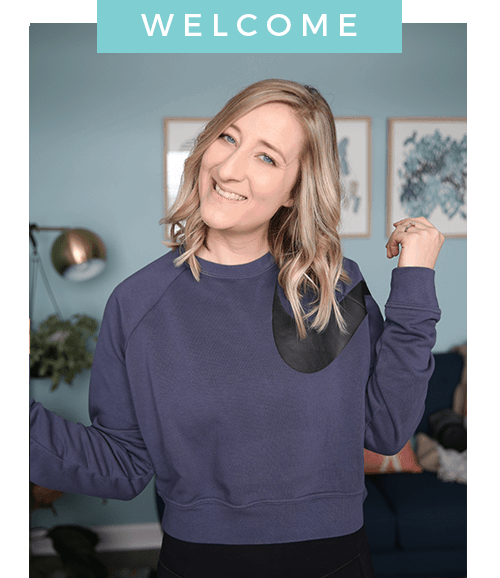 Thank you for helping support the brands I trust and have the pleasure of working with, making Fit Mitten Kitchen possible! 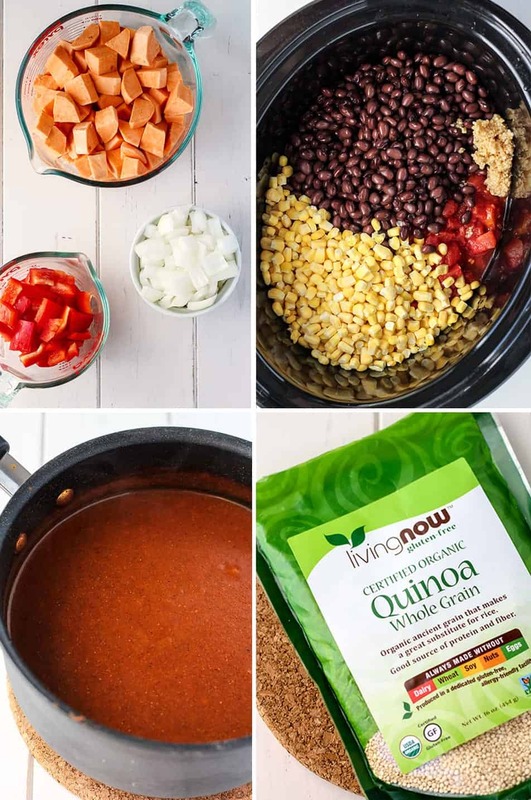 I’ve been making different versions of this enchilada quinoa chili for the past couple of years, and I thought it was about time I share one of my go-to slow cooker meals with you. So here we are with likely the 439th quinoa chili recipe, Fit Mitten Kitchen style. 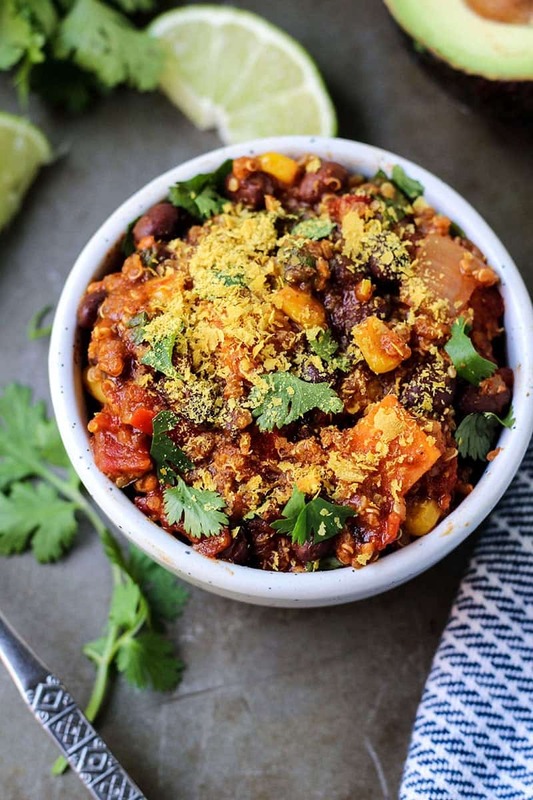 But for REAL, I love this enchilada quinoa chili. 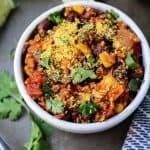 I actually have this particular recipe to thank for introducing me to a sweet potato and black bean chili in the first place, which eventually morphed into what we have here today. Once the sauce is ready you just mix all of the ingredients in the slow cooker and cook on high for about 3-4 hours. Note: This recipe makes a hefty batch and will serve a large crowd. We froze about half of it, being just Drew and I, and we enjoyed the (unfrozen) leftovers all week! toppings: avocado, cilantro, nutritional yeast, tortilla chips, etc. Have your enchilada sauce and veggies prepped. 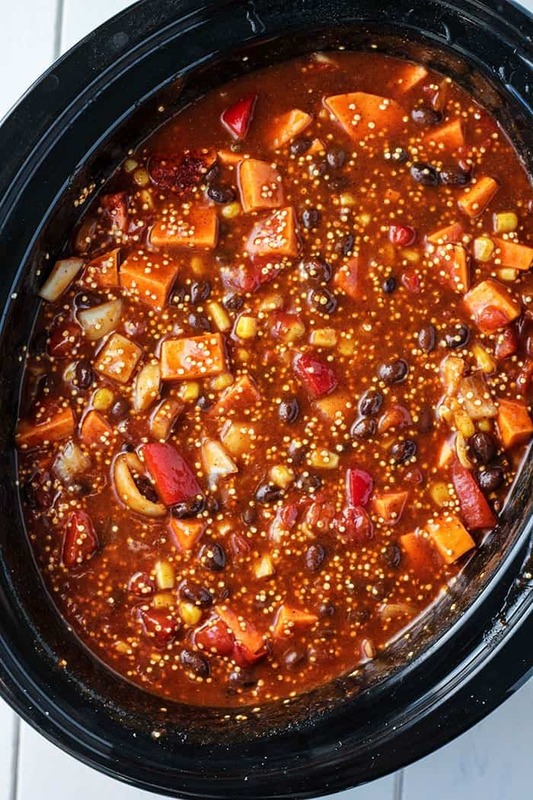 In slow cooker, add sweet potatoes, bell pepper, onion, black beans, diced tomatoes with juice, corn and garlic. Sprinkle in seasonings and stir until ingredients are combined. Add in quinoa, enchilada sauce, water, and lime if using. Stir together until ingredients are evenly dispersed in slow cooker. Cook chili on high for 3-4 hours until sweet potatoes are soft. Serve in bowls and add on favorite toppings, enjoy! *Use enchilada sauce link and follow instructions, but double to make 4 cups. I also subbed in avocado oil and an all-purpose gluten-free flour. Chili should serve about 12-16 medium-small bowls as written. Store leftovers in fridge up to one week, or transfer to airtight container and store in freezer, up to 3 months. Nutrition info approximate, based on 12 servings. Yes, love how filling chili is! And seriously always satisfying! Thanks Brie, hope you enjoy! This sounds so good, and even though I love real cheese, I also weirdly love the taste of nutritional yeast. I don’t think you can ever have too many chili recipes, tbh! I’ve actually never seen a recipe for quinoa chili, I guess I have been living under a rock for some time lol! Loving all the mexican flavors in here especially AVOCADO! You can never have too many versions of simple slow cooker meals! I’m so glad you shared. Love it girl! I’m pinning this! I think I’m going to make this for my meals next week. Hey Ashley! Love this. Love sweet potato and LOVE the slow cooker even more. Its been making my weeks worth of meals lately sooooooo easy. I feel crazy though – I can’t find the link to the enchilada sauce!? Can you point me to it? Lol no-not crazy! I am the crazy one who forgot to add the link 😉 It’s updated now 🙂 Thanks so much Cora, hope you enjoy! Sounds delicious! Can’t get enough chili this season, can’t wait to try! Thans Corrine! I love making chili too, I want to make so many kinds! I would add ALL THE SPICE. Sometimes I make this chicken curry and every time I’ve made it it’s been too spicy for Neil. I’m like COME ON MAN. lol I’m sure it would be way spicy for me then! 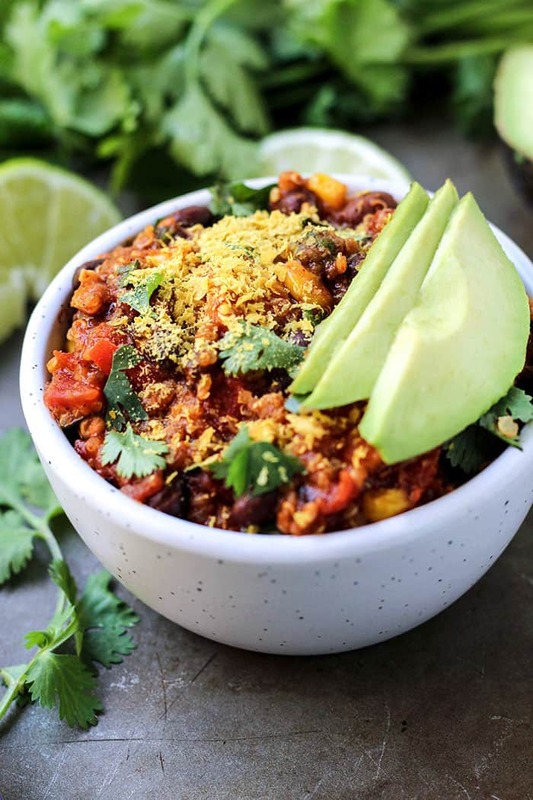 Oh that chili combo sounds good too–it definitely is interesting to see how everyone makes theirs! Made this last night and it was fantastic! Added a bit of guacamole to the top (grocery store didn’t have any ripe avocados sadly), but it was still delicious! Thank you for this recipe! 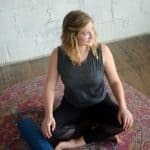 Do you mind if I use it to share on my own blog beyoutifullyhealthy.me? I’ll give you and your site the credit, of course. I love this recipe! Do you happen to know how many Weight Watchers points this is? Thanks for your comment and review Rachel! Unfortunately I am not sure the WW points here. Hi! Do you have the nutrition info for this recipe?! So excited to try! Thank you!! Would you say 1 cup is about a serving? What can i use if i don’t have a slow cooker? I haven’t tested this recipe on the stovetop but if trying, I think simmering everything together, except the quinoa, until the sweet potatoes are soft would work. I wouldn’t add in until the last 20 minutes so it doesn’t overcook. Can I cook this all day on low? Do you know about how many hours that would be? Thank you, can’t wait to try this recipe! Hi Michelle, I haven’t cooked this on low before but my guess is that it would need about 6 hours. If possible, I’d check on the tenderness of the sweet potatoes after 5 hours. How would I convert this using an instant pot? I haven’t actually done that with this recipe yet! My *guess* would be maybe 8-10 minutes on Manual pressure? ?